This is just a quick note for the people who are on the Windows Phone 8.1 Update and are trying to install the Lumia Cyan firmware update. Once the phone has updated, You then need to go into settings and select Phone Update. Once this update is finished Go back to 3 until the updates are completed before carrying on. Check for update again until there are no more updates and to get your phone back up to 8.1 Update. This process takes a loooooooooong time so be prepared to spend a couple of hours doing this. I’ve just been trying to deploy an Azure web role so that it would be available on our company WAN. This is easy for a VM as you just need to specify the Virtual Network when you create the VM. But for a Cloud Service it’s not so straight forward. It turned out to be pretty simple though once I had done some research. The first thing that needs to happen is a small change to the ServiceConfiguration.Cloud.csfg file. The VirtualNetworkSite name is the name of your Virtual Network. InstanceAddress roleName is the name of the Web Role in your Cloud Service (Usually the name of your website in your solution). Subnet name can be found on your Virtual Network Address Spaces section on the Configure tab of your virtual network. Once that is done and you deploy your website (Make sure you deploy in the same datacentre as the virtual network), you should be able to access your site on the internal network. First Double click the role in the Cloud Server project of your solution in Visual Studio. Select Endpoints and change the default end point from External to Internal. Then 80 in the private port. If you deployed now you would no longer be able to access the website via the external cloudapp.net address. But there is a problem, the Cloud Service’s internal firewall will block port 80 making it impossible to connect to via the internal network as well. Once this was deployed the site was blocked from the internet but available on the internal network. This is just a quick post about an issue that was driving me nuts. 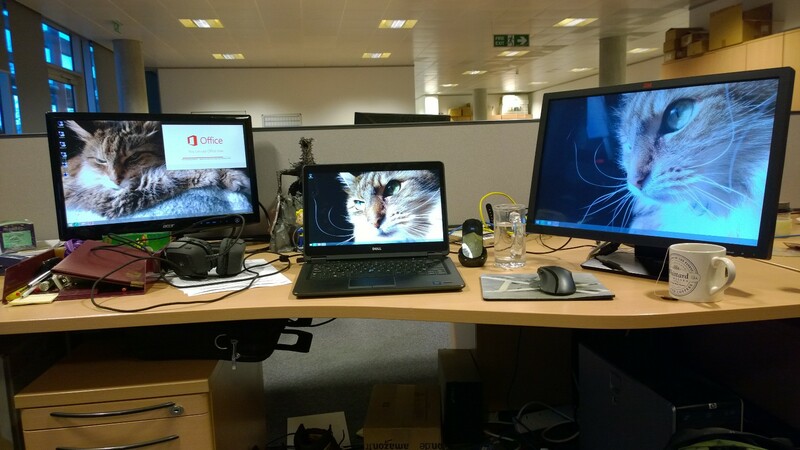 I’ve just got a new work laptop and I have two external monitors connected via a docking station. As you do with a new set-up, I was trying to get the displays setup with the best settings so I was playing with the zoom settings for each monitor. The upshot of this was the mouse cursor had disappeared. If I moved the mouse around, it would still highlight any thing it went over and if this caused the point to change to a different image, it would briefly appear as that image and then disappear again. After much searching I came across a post on Tom’s Hardware site where someone was experiencing a similar issue and the advice that simonjonestlp gave, fixed the problem for me. That is it. After this I could see the cursor again. Just a quick post for other people who find that they are having problems trying to build a Maven Job in Jenkins. I’ve just spent the best part of an afternoon trying to track down why I kept getting a Non-resolvable parent POM error message while trying to build a Maven Job in Jenkins. It worked fine in the command line but refused to build in Jenkins. After lots of hair pulling out and other people um’in and ar’ing I eventually found a solution. If you keep getting this error, try creating a new Freestyle Job and add the maven build as a build step. It worked great for my project. I hope this post saves anyone else a wasted afternoon trying to track this down. Took me a few hours to work this one out so I thought I’d post a small code snippet to show how it is done. It cheats in the fact that it downloads the file first and then does a checksum on it. But this is going to be used as a trigger for something else. Private _baseUri As String = "http://mysite.com/myfiles/"